The Stellar Industries Container Carriers can meet all your container delivery, switching and now dumping needs available with the optional 360° rotator attachment. The Stellar Container carrier boasts an 8,000-pound lifting, dumping and transporting capacity. The ECCR model features extendable forks for easy pick-up and placement of containers, continuous rotation for dumping from either side, and has the ability to distribute significantly more weight to the front axle than competitive models. Stellar Container Carrier features include improved visibility of rear lights, less cylinders and seal kits to maintain, and an overall heavy-duty construction and the ability to move front-load and rear-load containers. Equipped with the hydraulic 360 degree continuous rotator, the container carrier can dump front-load containers with no limit to the direction or extent of the dump angle. Extendable and retractable fork body with rotator. 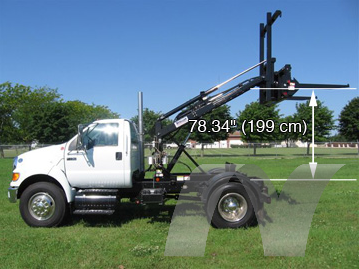 The center of gravity of the ECCR unit is located approximately 17″ in front of the rear axle. In the stored position, the center of gravity of the container is located approximately 43″ behind rear axle. From the top of the frame rail to the bottom of the fork is 78.34″ (199 cm).